Each year as flu season approaches, office workers tend to see absences amongst colleagues increase as one by one, they are stricken ill and unable to attend work for at least a few days. Those that do come to work despite being ill increase the risks of illness for others significantly, who might have otherwise remained healthy had they not been exposed to infection. The flu isn't the only virus office workers need to be weary of. The chances of catching anything from a cold to a stomach flu or even more debilitating diseases in an office setting are quite common, especially in large offices in which ten or more individuals share common spaces. These can include the kitchen or lunch break area, the bathrooms, and equipment such as fax and copier machines, telephones, and computer keyboards. Water fountains and water coolers are also hotspots for bacteria, as are candy machines and microwaves. One sick individual can facilitate the spread of an illness if others aren't taking proper precaution in order to stay healthy. While an illness can certainly strike at any time of year, the reason individuals tend to see more outbreaks in the winter is due to the fact that more people are spending time in a contained area, avoiding going outdoors in the cold. Additionally, the colder air also serves to dry out our sinuses to a level where viruses can more easily find a hold within your nasal passages and subsequently infect you further. Further increasing the risk for infection, many office workers still choose to work rather than take a sick day when stricken by a cold or the flu. Because a single sneeze can spread a cloud of germs outward in a three-foot radius, colleagues don't even necessarily need to be in close contact with a sick individual in order to become infected. Where are the Germs and How Can You Avoid Them? In an office, germs can reside on many surfaces that multiple individuals come into contact with several times a day. Each moment of contact with a telephone receiver, door handles, faucet handles, light switches, counter tops, etc., can significantly increase your chances of contracting an illness if you aren't suitably prepared. While there is no guaranteed method for resisting catching the cold, flu or other illness in the workplace completely, there are several things you can do on a daily basis that will greatly increase your chances of remaining healthy. One of the largest contributors to the spread of the flu from one office worker to another is a weakened immune system. Your chances of being susceptible to cold and flu-related germs and bacteria are significantly increased if your immune system is compromised. Getting enough rest each night, decreasing stress, eating healthily, and taking a multivitamin each day is the best course of action for ensuring a healthy immune system. The complication that arises is that this simply might not always be possible on a daily, consistent basis. Products containing Echinacea and Vitamin C that promise to help you stave off a cold once you sense the beginning symptoms offer false hope. While there may be some truth to the claim that the product can help you get healthier faster, you have in fact already become sick, and if you have been at work, you have already successfully spread the bacteria around the office. Symptoms may not always be immediately present. Those infected with a cold in its initial stages may feel perfectly fine for a day or two before actually realizing that they have a cold. This means that an infectious co-worker might be contaminating the office area without warning. 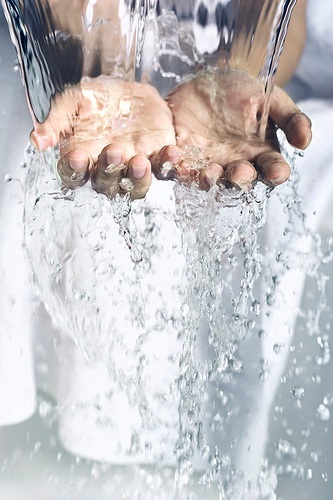 Keeping your hands clean is always an essential factor in preventing illness, as most germs and bacteria, especially those related to colds and flu, are transmitted through contact via your hands. 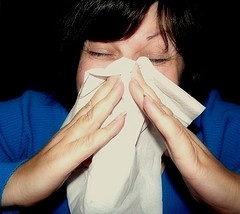 If you touch an object or surface that an individual with a cold has already contaminated, and then subsequently touch your nose or your mouth, you will greatly increase your own chances of becoming sick. Many offices today keep antibacterial soap in the bathroom or in the breakroom. Regular soap and water also works just as well. You might also consider keeping a small bottle of hand sanitizer or a package of sanitizing wipes by your workspace so that you don't need to travel to the bathroom often simply to wash your hands. As a good rule of thumb, make a habit of washing your hands with soap and water (or antibacterial soap) for approximately 20 seconds. This ensures that you have significantly cleaned your hands of harmful bacteria. In addition to washing your hands after using the restroom, do so before and after easting, and if you've come into contact with a lot of objects or surfaces commonly touched by others. There can be such a thing as too much antibacterial soap. Use it only when necessary, or it can tend to dry out your hands, and too much may even make you more susceptible to colds as it can prevent you from building an immunity to germs. Your own work area is your first line of defense. You have the power to keep items clean with wipes, disinfectants, and other cleaning products. If a co-worker uses your computer or telephone, it is always wise as a precautionary measure to clean the items before using them again yourself. While you can certainly ensure that your own work area is clean and bacteria is minimized, you cannot always rely on your co-workers to be as vigilant with their own work area and items. Before using someone else's computer, phone or other equipment, you should also seek to ensure that it is clean. If you cannot clean the items beforehand, ensure that you wash your hands thoroughly afterwards. Be wary of using cellular phones that belong to your colleagues. Cell phones, and especially smart phones, due to all the hand contact involved, are harboring an especially large amount of germs and bacteria, and often aren't cleaned as much as they should be. As an additional measure, you may consider using a small air purifier at work in your workspace. An air purifier can be of great benefit to anyone with allergies or working in a poorly ventilated area. It is understandable that your superiors will not expect nor want you to stay home from work simply because of the common cold. However, if you are ill with the flu or other sort of virus, then exercise common sense and courtesy and take a sick day until you are better. If you must go to work, make your best effort to avoid contact with others and their items, clean your hands, and any items you use. Be sure to cover your mouth when you sneeze or cough, and keep tissues or a handkerchief close at hand. 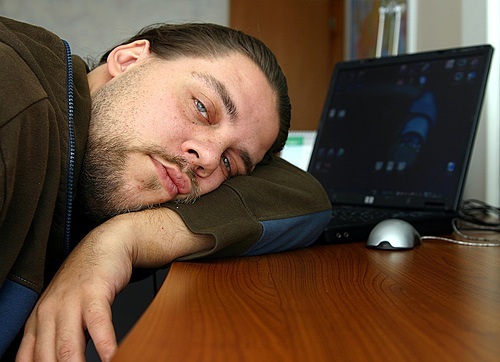 One sick person who goes to work can diminish productivity across the entire office within days if they infect others. Those individuals, in turn, may cause others to get sick, and the cycle continues. Attempting to work while sick only serves to increase your stress and prevents you from getting the rest your body sorely needs in order to properly fight of the cold or flu and get well. When facing a sick individual who refuses to go home, definitely avoid using anything that person may have touched throughout the course of the day. You might also consider talking to your superior about encouraging the co-worker to go home, so that the overall health and productivity of the office doesn't suffer for it. 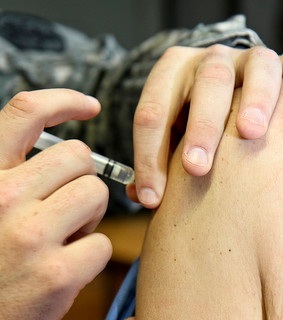 Most physicians today recommend getting a flu vaccine. Some people swear by them, while others feel that they get sick because of them. The effectiveness of flu vaccines actually do vary from year to year, as do the strains of flu that surface during each flu season. Additionally, an individual's overall health can also be a factor in how well the flu vaccine will help. It is encouraged that all who are able to get a flu vaccine should, even if they have already experienced any symptoms previously of either the flu or the common cold. As there are different strains of the flu circulating, the flu vaccine has been developed to ward off the most common viruses affecting individuals. Additionally, the flu vaccine has a much greater rate of effectiveness than it does non-prevention of flu symptoms, and so the odds are on your side. Taking all these precautions into consideration and practicing them on a consistent basis may not protect you 100% from catching the cold or flu, but it will certainly lower the risks significantly.